Creating your first Google AdWords account may be daunting, but I’m here to simplify the process. In this guide, I’m going to share how you can build your first Google AdWords campaign in the first few hours. Getting the structure of your AdWords account correct will set you up for success down the road. I’ll share how I rebuilt a client’s PPC account and instantly lowered their cost-per-click and improved their cost per acquisition from this method. In excel, I have individual tabs for each section of the account. Campaigns, Ad Groups, Keywords, Ads, Sitelinks, Negative Keywords, and more each have their own section. In the pictures below, I’ll have a screenshot of each section within Excel and show you how to build everything. In the campaign section, I have the following three columns at the top. Campaign, budget, and Status are all necessary to have via the build. When we upload everything into Google AdWords Editor, we need to have the Excel columns match up with the Editor tool. It’s critical to put the status as Paused when you upload your content because you don’t want your content to go live until you are ready. When it comes to building a campaign, I tend to break out my account into the following sections. A brand campaign consists of keywords that include my client’s name. I will use BMM which stands for broad match modifier to catch any long-tail keywords that I would not have thought about using. Then I would have an Exact Match (EM) campaign which means I want these specific keywords to trigger my ads. The ad group tab has the following columns at the top. Campaign, Ad Group, Status, and Bid. You need to have the campaign match up to the ad groups, so if you have five ad groups, you need to repeat the campaign name five times in the campaign column. You may be noticing a pattern now with each Excel tab and how it builds off from the previous tab. 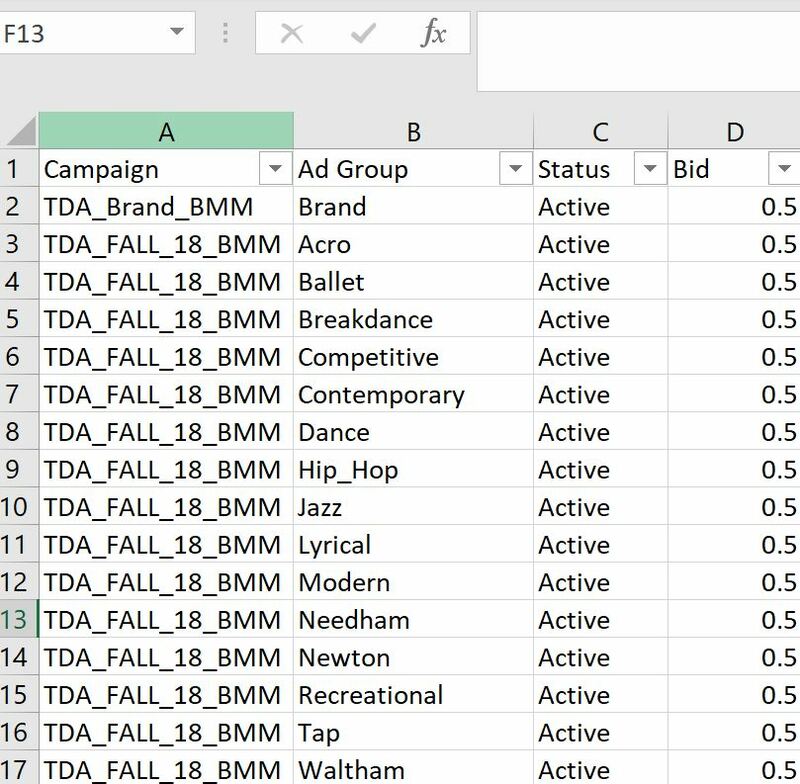 By building everything into Excel, I can create a pivot table at the end to check to make sure every campaign has an ad group, ad, and keyword before I launch my account. The keywords section is important to have an initial build to start, but you will most likely continue to add more keywords to your account once your campaign goes live. My suggestion is to build the basics and optimize as you go forward. Don’t spend too much time thinking of every keyword, you can let the BMM campaigns illustrate what words to have. For the keyword tab, you need to have the following columns. Campaign, ad group, keyword, final URL, and match type. The final URL is where you want people to land on your website. The match type will tell Google Ads what type of phrase match you want your keywords to show up as. I find success with Exact and Broad Match Modifier, but you can also use Broad and Phrase match. The ads tab will be what ads would show in Google for someone searching for a keyword that triggered your account. There are elements to remember when building out the ad campaign. You have 30 characters of space to utilize for headline 1 and 2, so make sure you use it! Spaces do count as characters, so it’s best to use the TRIM function in excel to remove any extra spaces if your character limit was over that threshold. The description text can be up to 80 characters, so it’s best to use all the space. The columns that you will need include Campaign, Ad Group, Headline 1, Headline 2, Description, Path 1, Path 2, and final URL. Path 1 and Path 2 allow you create your own URL slug for the ad which can increase your click-through rate. For example, I might search on Google for Yankees Tickets, and I see a few ads in Google. Path 1 and Path 2 could say something like Yankees and Tickets which would tell me as a user I know where I would go if I click on this listing. You will notice from the picture above that there are sitelinks on the ads. Sitelinks are a great way to beef up your ads (create larger listings) and send people to specific sections on your site. A great way to utilize sitelinks is to group similar elements. For example, I might bid on the keyword women’s shoes which is a generic search. Women shoes could mean anything, so I have my ad land people on the women’s shoe page which includes links to all styles. For my sitelinks, I would be smart to include links to women’s sandals, women’s clogs, women’s dress shoes, and so on so somebody searching in Google could see that sitelink and land directly where they need to go. Here are the columns that you will need to add to your sitelinks tab. Campaign, link text, Description Line 1, Description Line 2, and Final URL. Google Ads Sitelinks best practices are about grouping similar items together which I broke down above. Another best practice is to have a minimum of six sitelinks per campaign, but you can have more than than. 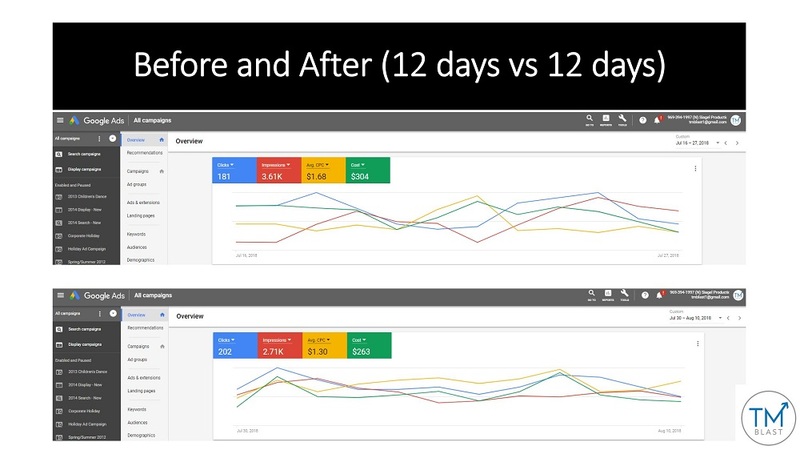 Google over time will show the best sitelinks to your target audience best on keyword intent and historical performance, so you don’t need to worry about which ones to prioritize. Other elements to consider is the length of these ads in character limits. Description line 1 and 2 can be up to 35 characters while the link text is 25. One trap that I’ve seen by auditing AdWords accounts are the lack of negative keywords. Negative keywords are the words that you don’t want your ads to trigger for. An example of words that I would not want triggering my ad could be a school. For example, I’m working on the Clarks Shoe account, but I don’t want my ads to trigger when someone is searching for the school. To stop Google from showing my ads, I would negative out the words school, college, program and university to immediately deter Google from showing my ads. Negative keywords can do a handful of wonder things to your account. First, you will lower your total spend which is is a win for any business owner. Second, you will improve your CPA (cost per acquisition) and ROAS (return on ad spend) because you are limiting invalid clicks to your account. Third, you are then strengthening your campaign daily budget because you are not wasting clicks on unnecessary keywords, so your ads can appear more often if you have a certain limit per day. Here is a helpful guide on finding negative keywords in Google. 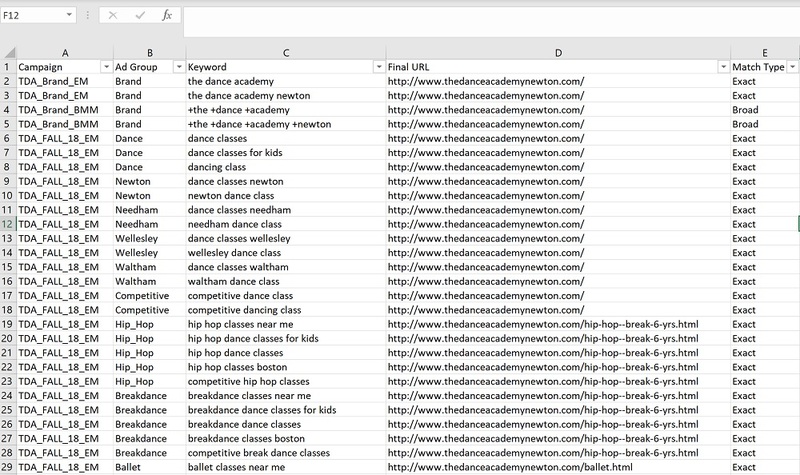 To create negative keywords, you put the words into a list in excel. You then head over to your Google Ads account and place them in either at the account level, or for individual campaigns. The best practice for negative keywords is to audit your search query report daily to find words to block. Now that every section is built in Excel, we can use Google AdWords editor top bulk upload everything. My first suggestion is to download your full account just in case there are campaigns already in your account. The tool will pull your latest info from the UI into the tool, so this will limit any sync errors. By making all the changes in Editor, you will save yourself hours of manual time and limit errors. To Start we click on the campaigns tab on the left-hand side and click on “make multiple changes” at the top. The campaign comes first in AdWords, so we start with the campaign and move from right to left in the excel document. Next, you copy and paste the results from the campaign tab in excel directly into Google AdWords editor and click process. One suggestion to have a more sufficient launch is to update the targeting method of your campaign. By default, AdWords will open your account to reach as many people as possible which is not always ideal. You want to be smart with your money, so you need to refine your scope. If you only want to show in the United States, you need to tell Google to just show your ads in your target location which is the Untied States. As you go down the left-hand side of Google AdWords Editor, you will see that the process will repeat. You click on Ad Groups, make multiple changes, paste the results from the excel tab, and hit process. By having everything in an Excel Document, you will see how quick this process will be. This particular client came to me looking to boost their PPC performance for their business. While they already had an existing account, they had many errors including no negative keywords, broad match keywords, and a handful of other errors. Below are the results that I was able to perform for their business. As a note, a conversion for them was somebody signing up for their dance lessons, so it’s important to know what a conversion is worth so you can make mathematical adjustments. One way I was able to lower their CPC was to have strong quality score rankings. The majority of their keywords were a 7 out of 10 or higher, so they were paying less than some advertisers. 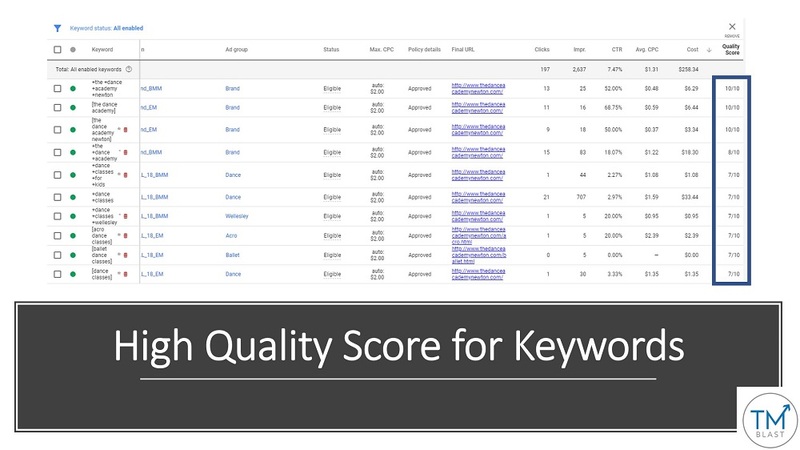 A strong quality score is the result of keywords matching ads. You can see below that the keywords that someone searches for triggers an exact ad. This may sound simple and obvious, but many people who come to me have a generic ad for a specific keyword. A generic ad will result is a lower quality score which means a higher cost per click. A higher cost per click means a lower CPA and ROAS, so you can see how taking the time will pay off for the company with savings.